The Centre and Mrs Iris O’Rourke are pleased to announce the successful recipient of the Paddy O’Rourke Honours Scholarship for prostate cancer research for 2017 is Ms Megan McIntosh. 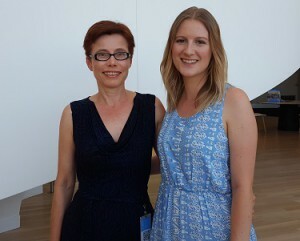 Megan, pictured left with Iris (Paddy’s wife), expressed her gratitude and honour on learning of her award. Megan met with Iris to talk about her project which is titled “Informing the development of person-centred support programs for men on active surveillance“. Megan undertook some preliminary work on this topic for her summer research with the Centre, and is excited about the opportunity to extend this into an Honours program. Specifically, Megan aims to investigate why men leave active surveillance without evidence of disease progression and how is this decision influenced by masculinity and the support offered and received. Megan has a Bachelor of Arts, majoring in Psychology from the University of Adelaide. Her supervisor is FFCMH NHMRC Post-doctoral Research Fellow, Dr Camille Short, and the project will be undertaken in collaboration with Professor Suzanne Chambers, Griffith University, QLD and Professor Daniel Galvao, Edith Cowan University (WA) and the Centre of Research Excellence in Prostate Cancer Survivorship. Professor Gary Wittert, the Centre Director, said that there is no better way to honour the memory of Paddy. Paddy was passionate about Freemasonry, the Centre, the importance of research, the need for better supportive care and giving others a hand. This scholarship ticks all those boxes. We wish Megan all the best for her busy and exciting year ahead. This entry was posted in News, Research and tagged honours, prostate cancer, scholarship, survivorship. Bookmark the permalink.